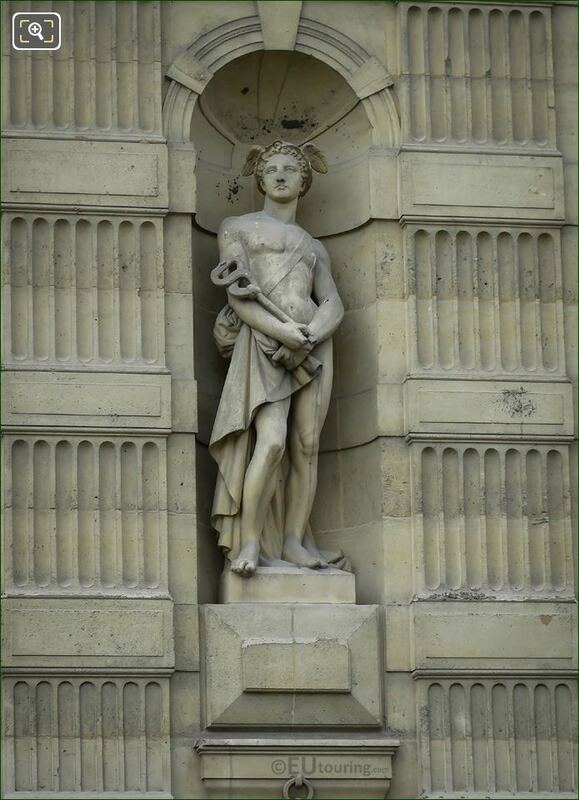 While we were admiring the Aile de Flore wing of the Musee du Louvre in the 1st Arrondissement of Paris, we took these high definition photos showing the statue of Mercure, the God of Commerce, which was sculpted by Louis Leopold Chambard. This first HD photo shows the statue called Mercure, which in English translates to Mercury, and as you can see this is located within a niche of the wing of the former Palais du Louvre called the Aile de Flore. And when you are within the Cour du Carrousel you can see this statue on the first level and is positioned on the far right hand side. 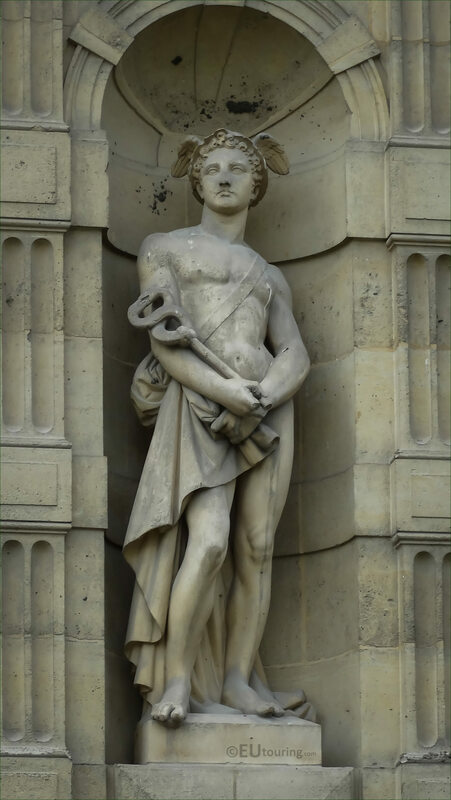 So Mercury is a major Roman God and in Roman mythology he was the God of Commerce, trade and financial gain, who is often portrayed holding a staff like in this sculpture. 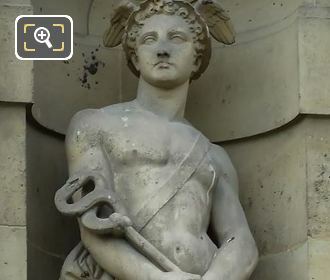 Yet in Greek mythology his counterpart is Hermes and therefore Mercury is often shown holding a specific type of staff called a caduceus that Hermes held, which later became the basis of the astrological symbol for the planet mercury. Now this particular statue of Mercure was produced by Louis Leopold Chambard who was born in 1811 in Saint-Amour, which is in the Franche-Comte region of France by the Jura mountains, yet he went to Paris to study at the Ecole des Beaux Arts under David d'Angers. Then, winning the Prix de Rome in 1837 he spent four years at the Villa Medici in Italy before returning to France where Louis Leopold Chambard received many public commissions for statues and sculptures for famous tourist attractions in Paris including the Palais du Luxembourg and of course the Palais du Louvre with no less than four including this statue of Mercury, the God of Commerce.